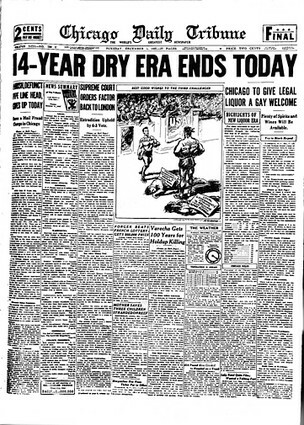 Today marks the 220th anniversary of the ratification of the first ten amendments to the Constitution of the United States. If ever there was a time that called for us to understand and to honor these sacred limits against tyranny, that time is now. 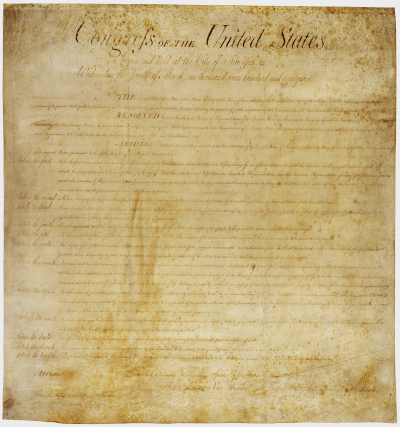 Here is the text of the Bill of Rights, originally proposed on March 4th, 1789 and ratified on December 15th, 1791, as transcribed by the National Archives. 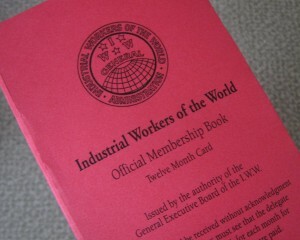 On Saturday, my red card from the Wobblies finally arrived in the mail. The postman brought the membership package (appropriately enough) while I was listening to the Illinois-World Labor Hour on WEFT Radio. Both emotionally and intellectually, the experience was akin to what we Catholics call the Communion of the Saints. 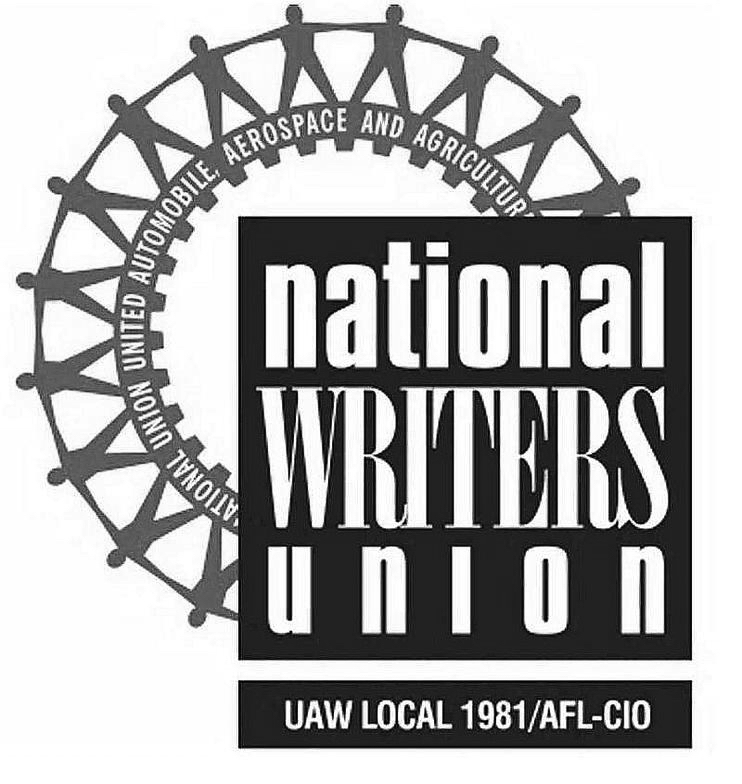 As a new member, I’m doing my best to learn as much as I can about the history, philosophy, strategy and tactics of the organization. Although becoming better informed and personally more conscious is my primary aim at this point, it strikes me that the act of organizing within my own local community will be the eventual test of my commitment, and the actual point of my having become a Wobbly. I must admit that the prospect frightens me a bit, as the process is utterly foreign to me. 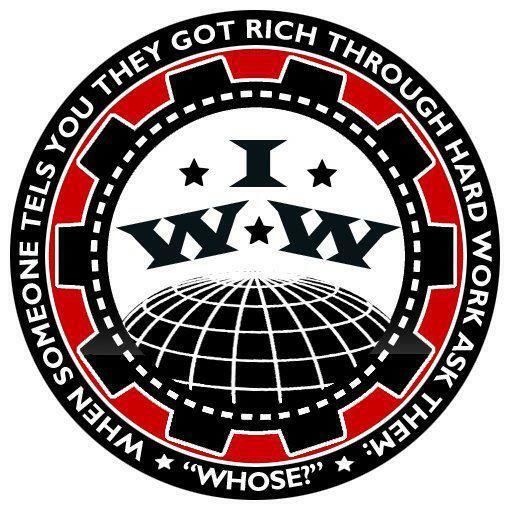 Fortunately, the IWW offers lots of resources and training to help new members learn the ropes. Everyone with whom I’ve had any contact so far has been extremely patient, friendly and helpful. Perhaps one day my Fellow Workers and I will achieve the dream of “building a new society in the shell of the old.” In the meantime you’ll find me taking baby steps in the right direction, with red card in hand. My wife gave me a Kindle on my birthday back in September, and I’ve been thoroughly enjoying the device. It’s very nearly the perfect thing for someone who spends a lot of time reading, and I find that I make more time to read as I have more content at hand on the device. I grab it as I’m walking out the door to go just about anywhere, and can usually steal a few moments away to read something of value while waiting in the van to pick up my daughter from school or such. 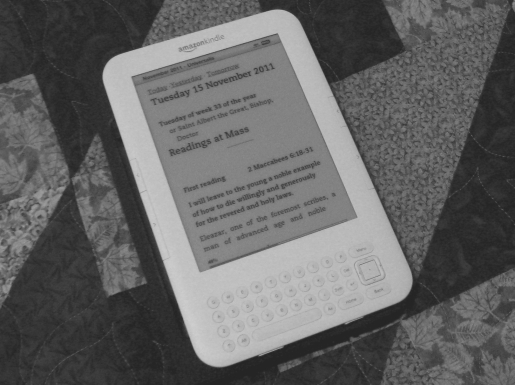 Of course, one of the first things that I looked for was a Kindle version of the Bible, which was relatively easy to find, but I also wanted to get the daily readings of the Catholic liturgical calendar on to the device. If I don’t make time for any other study or prayer during the day, I can almost always at least make it through those. Surprisingly, although the readings are online in several spots, it was a bit of a hunt finding them formatted for Kindle or other ebook reader. Fortunately I eventually found Universalis, a site that offers not only the daily readings at Mass, but also the Liturgy of the Hours and the Order of Mass. All of these are available on the Web, for mobile devices or in a downloadable version. They can also be exported to any of the major ebook formats. As we approach the end of Ordinary Time and the beginning of Advent, the revised Order of Mass for the English speaking world will take effect. For those of us who were born (or who converted to Catholicism) after the reforms of the Second Vatican Council were implemented, some of the phrases we’re leaving behind are all that we’ve ever known. Having the new Order at the ready on my Kindle is really nice, though I’ll probably still slip up and say “and also with you” for a long time yet. I also had to assure my mother-in-law that I was, indeed, reading the Scriptures after she caught me with the Kindle at Mass last Saturday night. I’ve not yet made it through an entire day praying the Divine Office, but having all of the prayers handy for each day has made it easier to explore this beautiful devotion – and I do aspire to one day adopt the habit of praying the Hours each day. The online resource at Universalis is entirely free of charge. If you’re interested in the software download or smartphone apps, the full featured free trial version lasts for one month, after that it reverts to a simple calendar version unless you purchase a registration code for a (one-time nominal) fee. You can click the banner below for more information, including today’s propers.